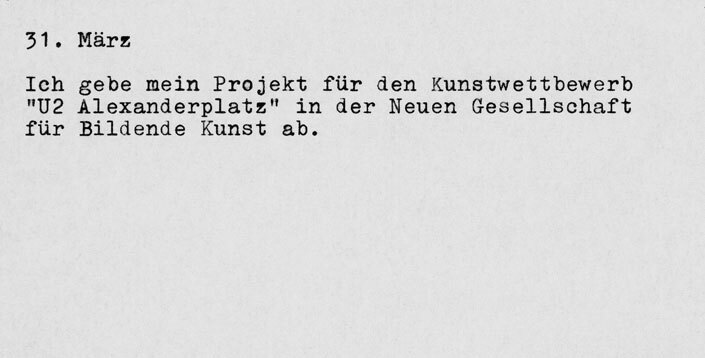 Ein Projekt der Neuen Gesellschaft für Bildende Kunst e.V. 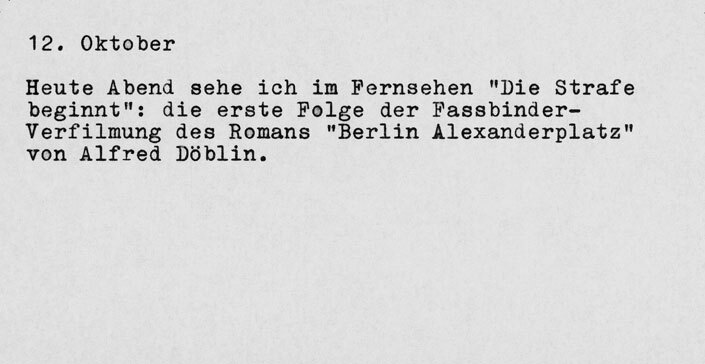 (NGBK). 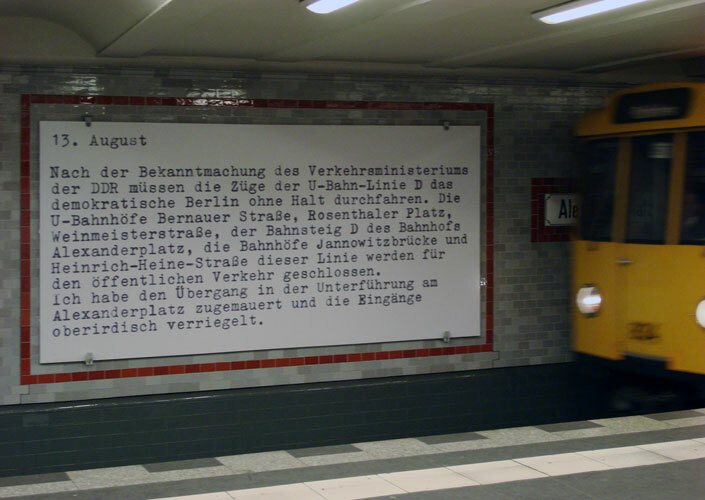 Gefördert aus Mitteln der Senatskanzlei für Kulturelle Angelegenheiten, unterstützt von den Berliner Verkehrsbetrieben (BVG) und der VVR Wall GmbH. 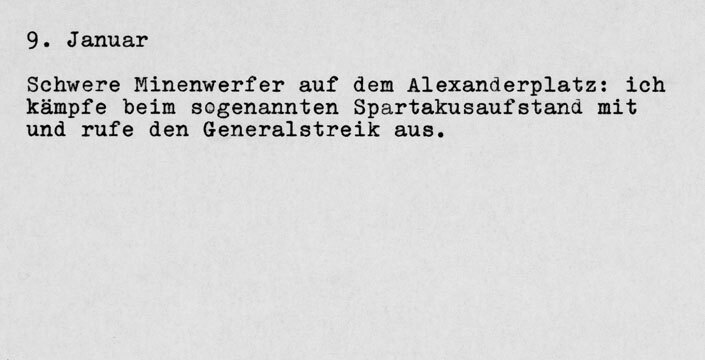 Heavy mortar fire at Alexanderplatz: I fight for the so-called Spartacus Rebellion and declare a general strike. 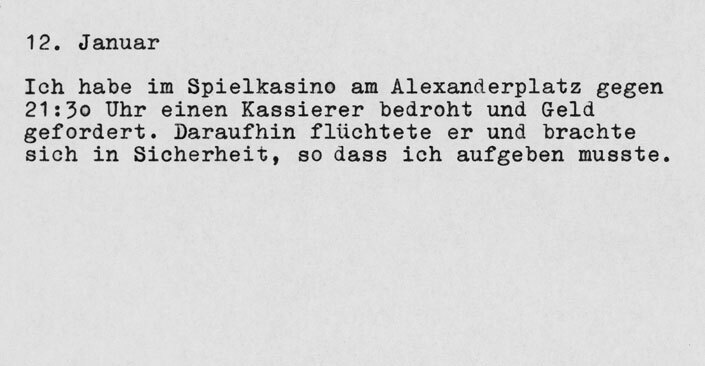 Around 9:30 PM in the casino at Alexanderplatz, I threatened a cashier and demanded money. But the cashier managed to escape, so I had to give myself up. 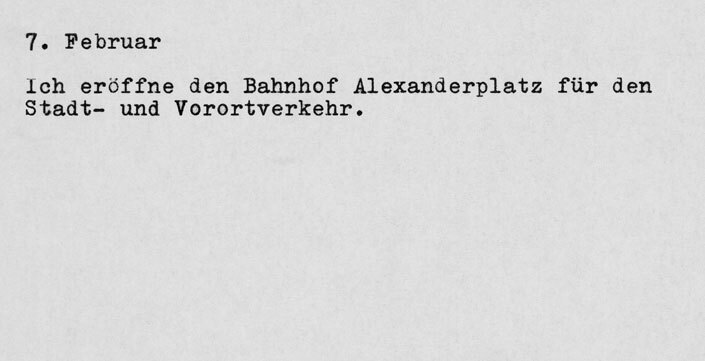 I open the Alexanderplatz Station for municipal and regional train lines. 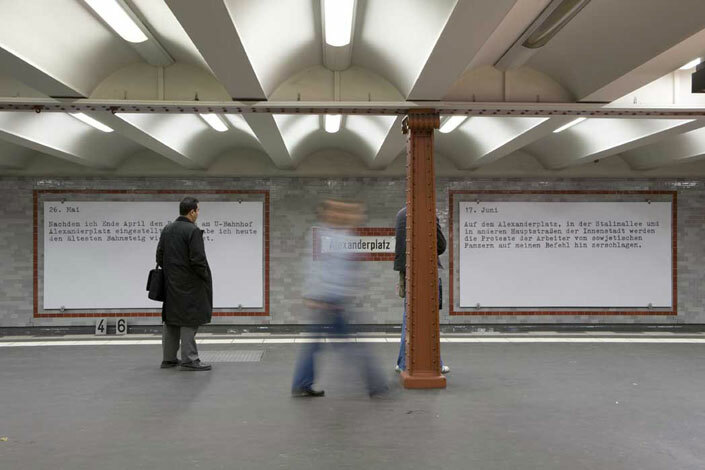 I study an announcement for a protest on a column at Alexanderplatz. 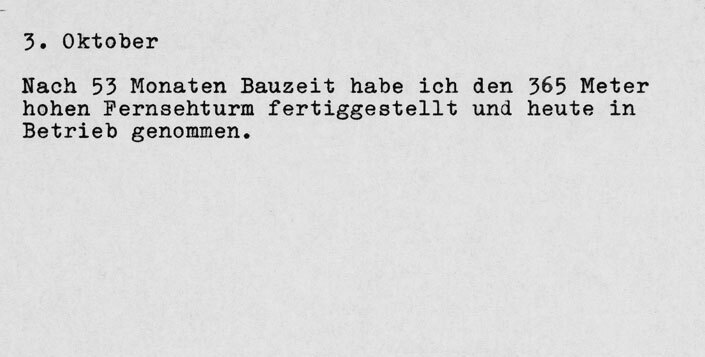 Suddenly, Franz is standing beside me. 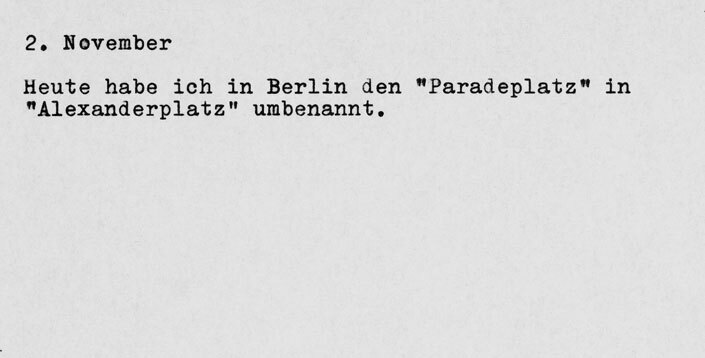 I carry out an air-raid, and almost completely destroy the police headquarters at Alexanderplatz. 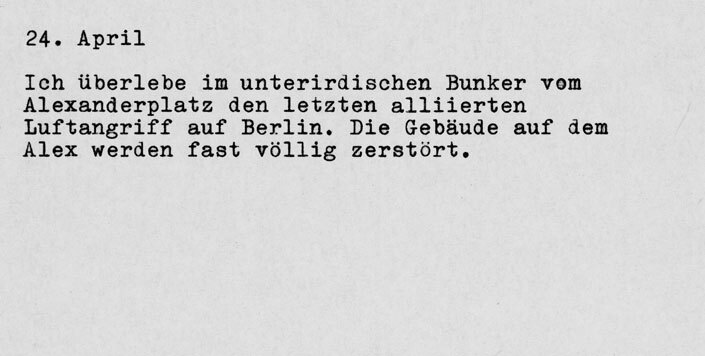 Several prisoners are buried under the rubble. 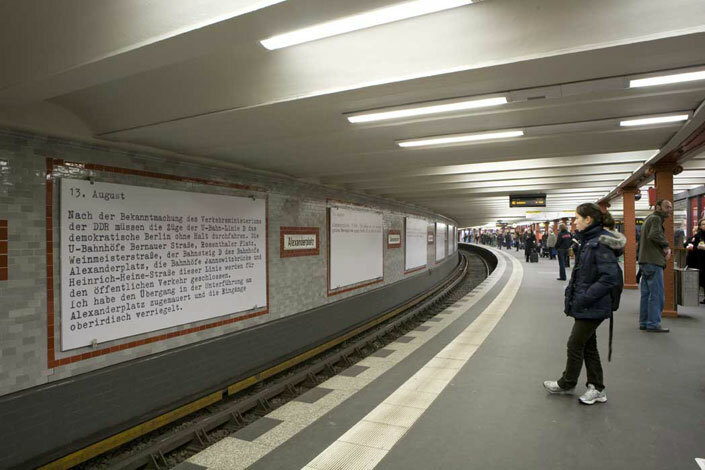 I submit my project for the art competition U2 Alexanderplatz to the Neuen Gesellschaft für Bildende Kunst (NGBK). 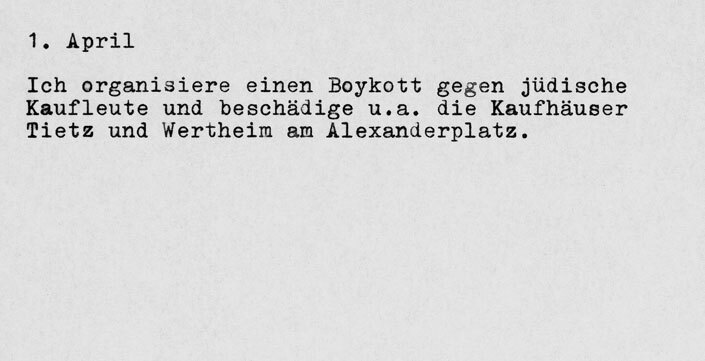 I organize a boycott of Jewish businesses and trash the department stores Tietz and Wertheim at Alexanderplatz. 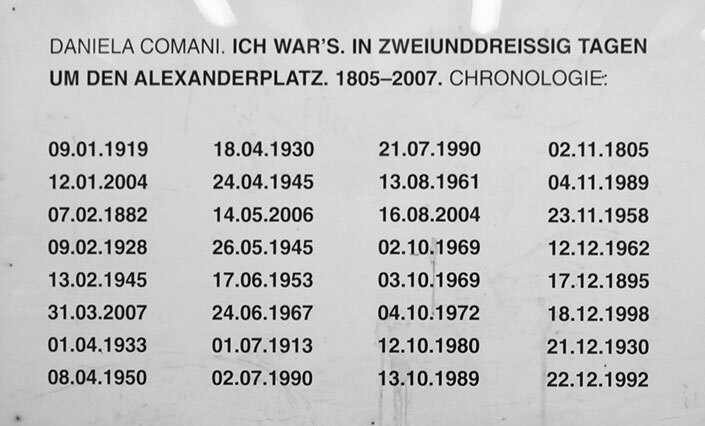 For 362 crimes, 127 of them serious felonies, I condemned the 18-year-old Al Capone of Alexanderplatz and two of his accomplices to death. 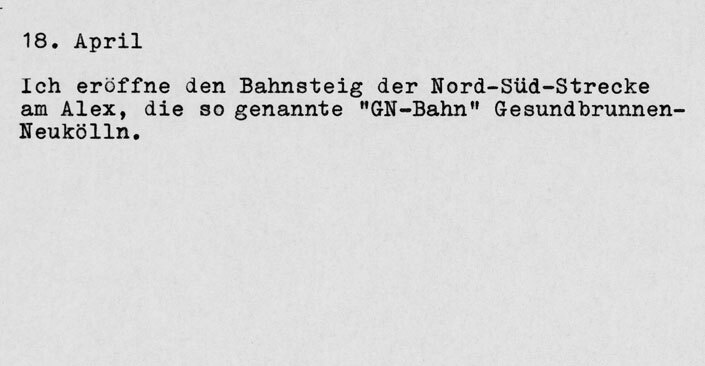 Today I open the train platform for the North-South route at Alex, the so-called GN-Line , Gesundbrunnen-Neukölln. 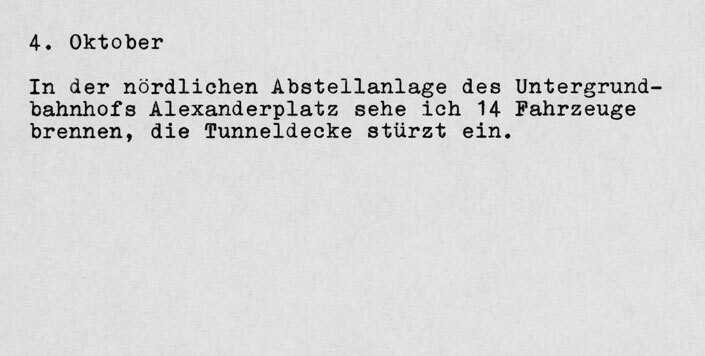 I manage to survive the last bombardment of Berlin by the Allies, in an underground bunker at Alexanderplatz. 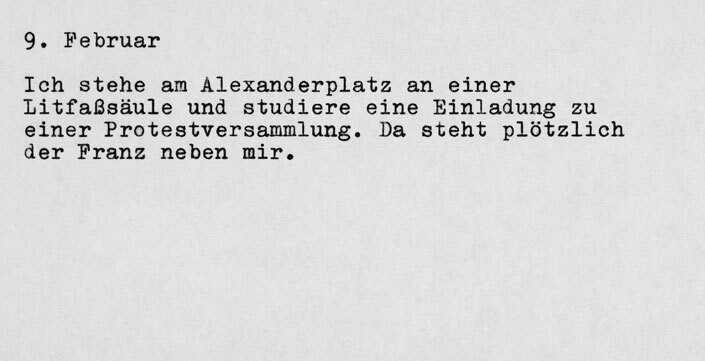 Almost all the buildings around Alex are destroyed. 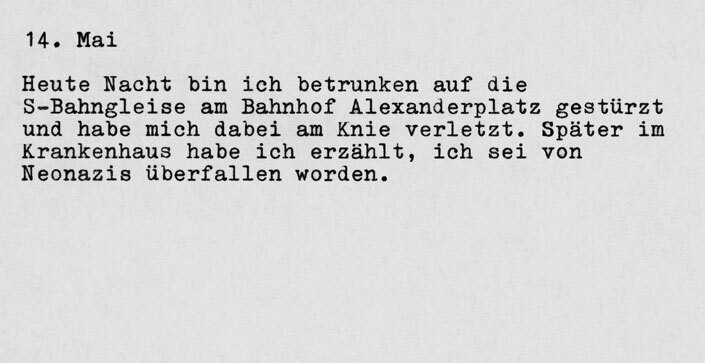 This evening I was drunk and stumbled on the S-train tracks at Alexanderplatz, hurting my knee. 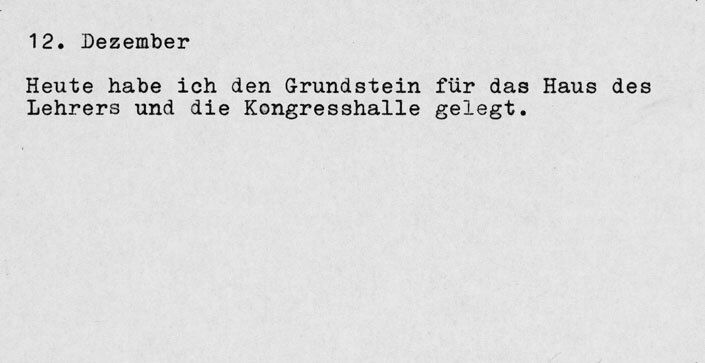 Later in the hospital I told them I was attacked by Neo-Nazis. 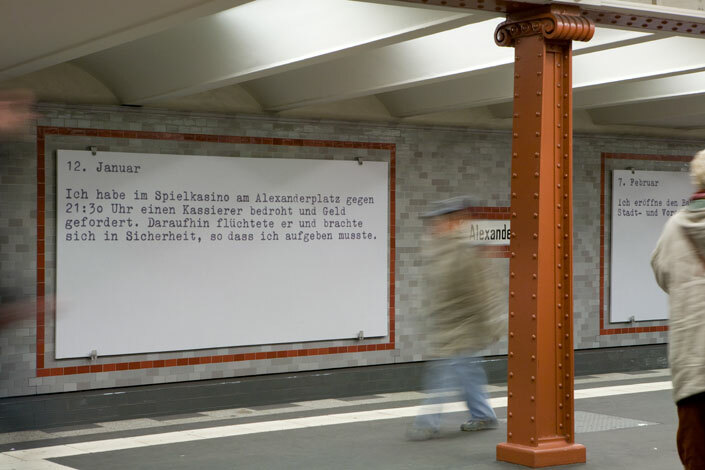 After closing the subway traffic in April at Alexanderplatz, I re-opened the traffic in the oldest subway station again today. 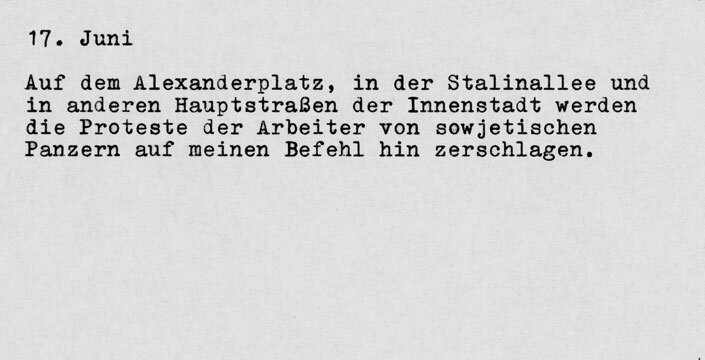 At Alexanderplatz, in the Stalinallee, as well as in other main streets around the city centre, I order the crushing of workers  protests with the help of Soviet tanks. 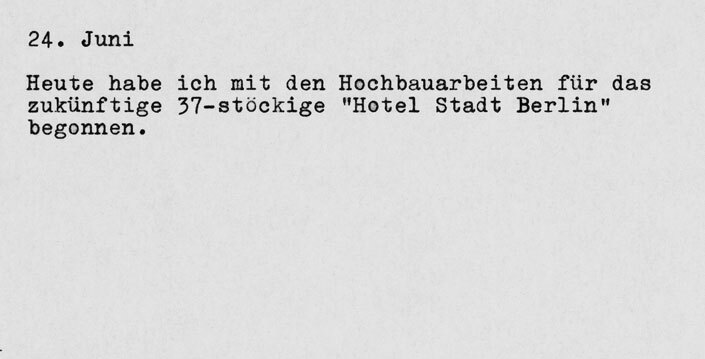 Today I started construction of the 37-storey Hotel Stadt Berlin . 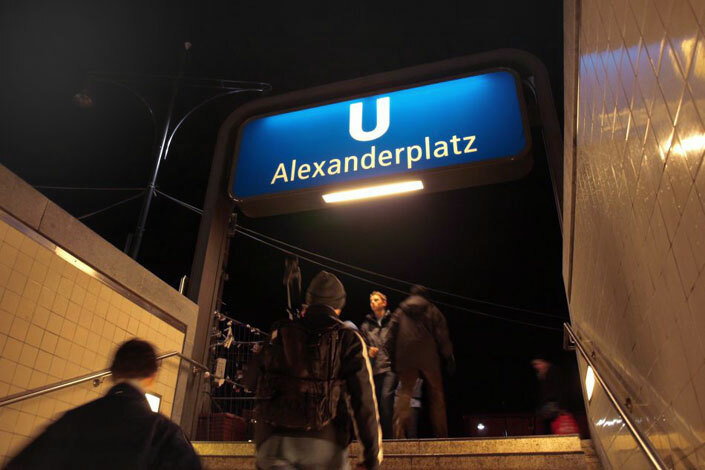 I open the platform for the new subway line Centrumslinie : Spittelmarkt-Alexanderplatz. 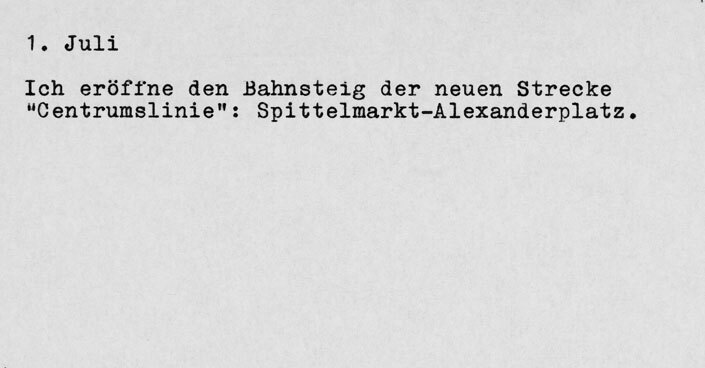 It is Monday, I am in Centrum-Department Store at Alexanderplatz and I pay for my purchase in West German-Marks. 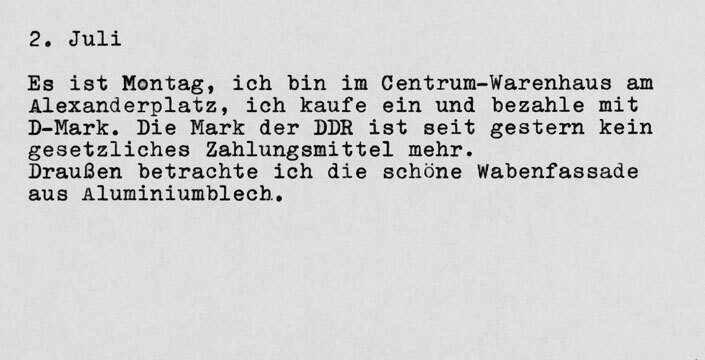 Since yesterday, GDR-Marks are no longer accepted as legal tender. Outside I admire the store s nice wavy façade made of pressed aluminium. 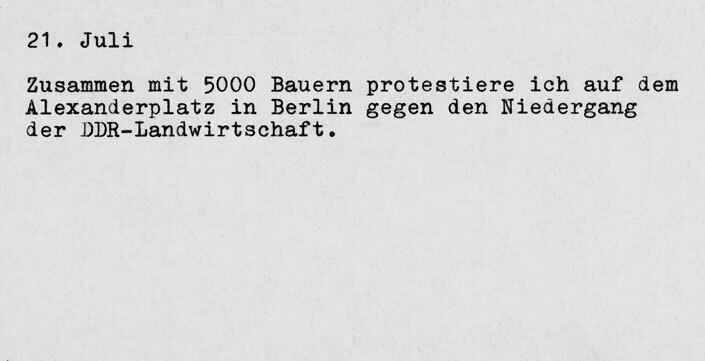 Together with 5000 farmers I protest against the demise of GDR farms at Alexanderplatz. 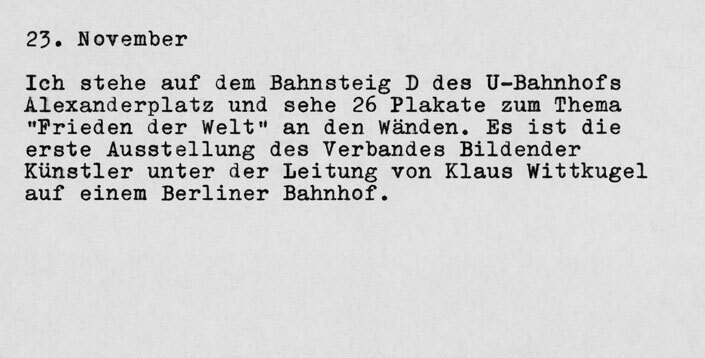 After a public declaration of the GDR transportation ministry, all trains on the D subway line must pass through the democratic sector of Berlin without stopping. 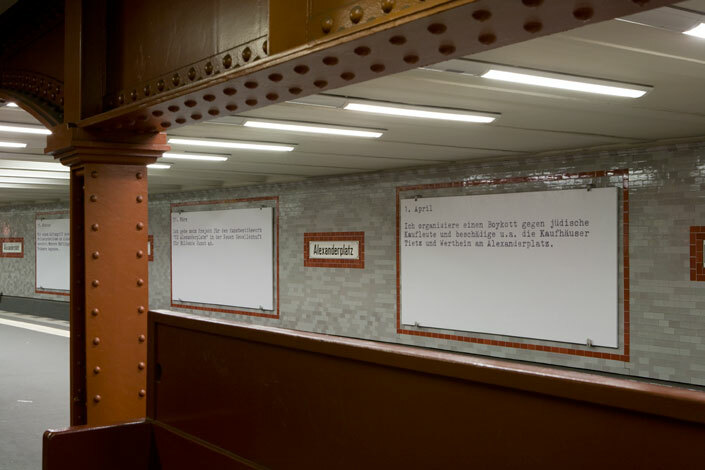 The subway stations Bernauer Straße, Rosenthaler Platz, Weinmeisterstraße, platform D at Alexanderplatz, as well as the stations Jannowitzbrücke and Heinrich-Heine-Straße are closed to the public. 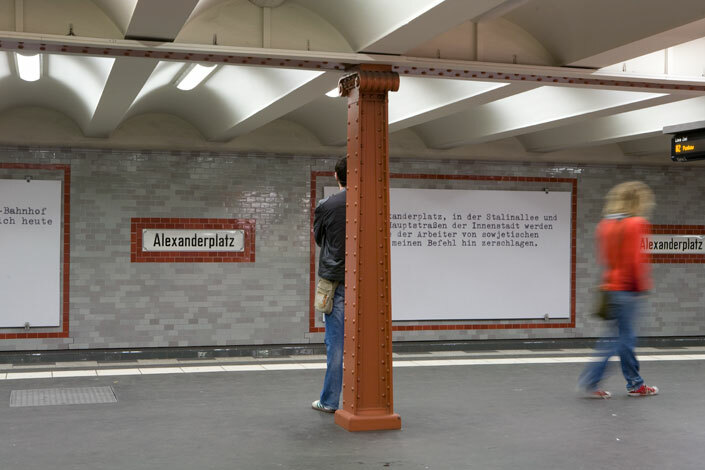 I bricked up the tunnel transfer at Alexanderplatz and closed the entrances above ground. 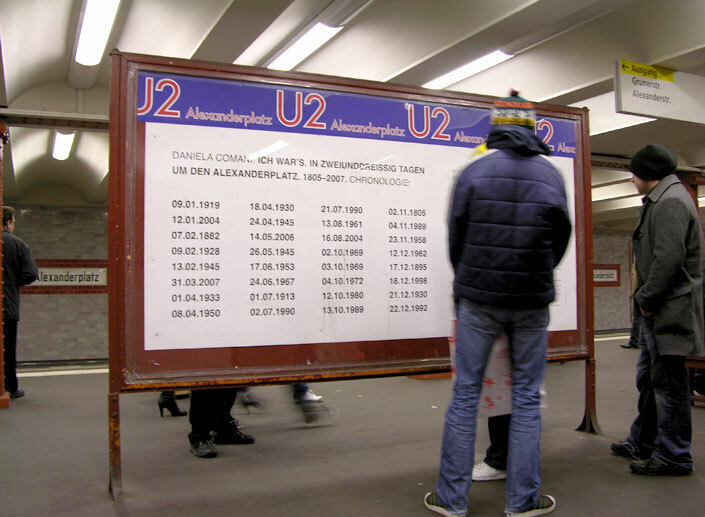 Alexanderplatz, 6 P.M. 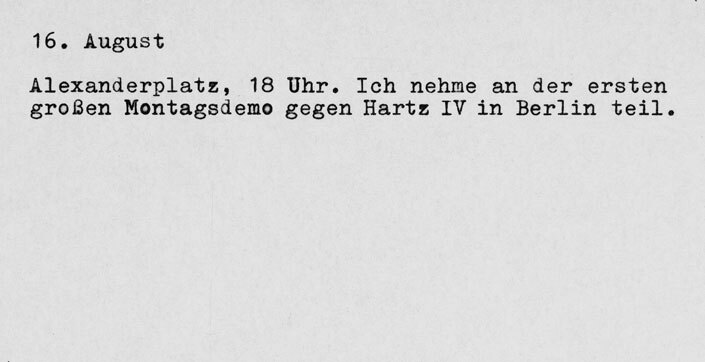 I take part in the first large Monday demonstration in Berlin against Hartz IV. 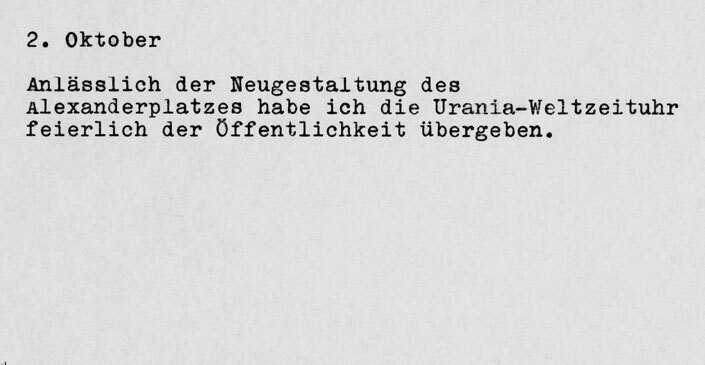 During the renewal of Alexanderplatz, I opened the Urania-World-Clock to the public. After 53 months of construction work, I finished the 365-meter high TV-tower, and started operation. 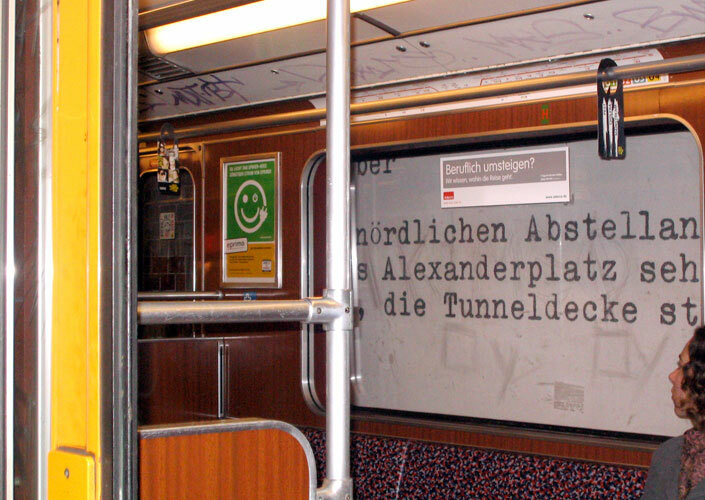 On the northern side-tracks of the Alexanderplatz subway station I see 14 cars burning, the tunnel ceiling collapses. 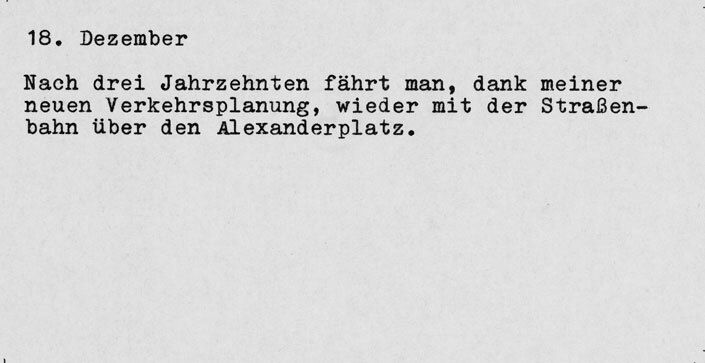 Tonight I watch The Punishment Begins on TV: the first episode of Fassbinder s adaptation of the novel Berlin Alexanderplatz by Alfred Döblin. 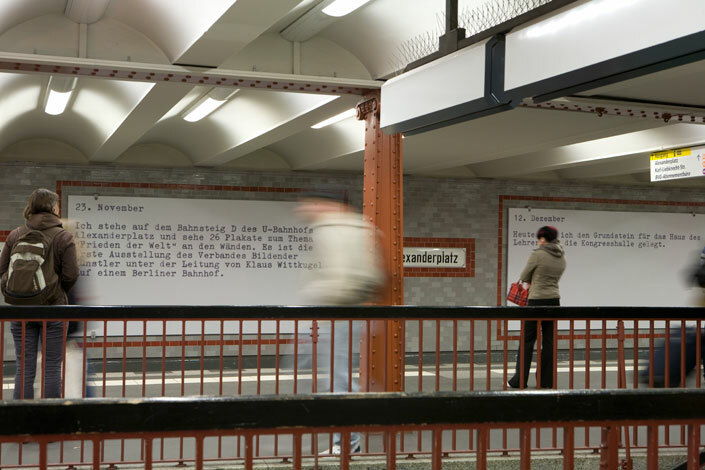 I reject the proposal Memories of Revolution in the VBK-art competition for the Alexanderplatz subway station. 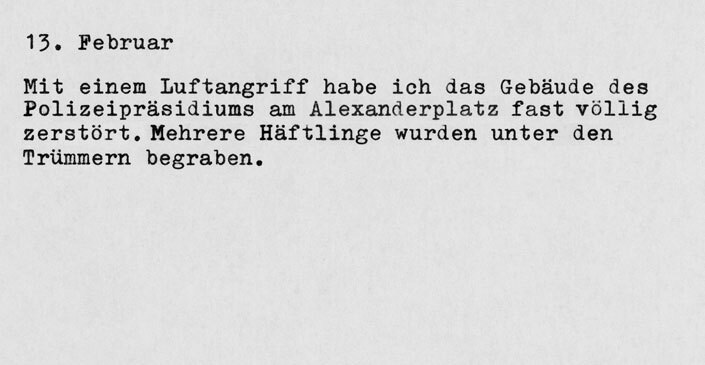 Today I changed the name of Paradeplatz to Alexanderplatz . 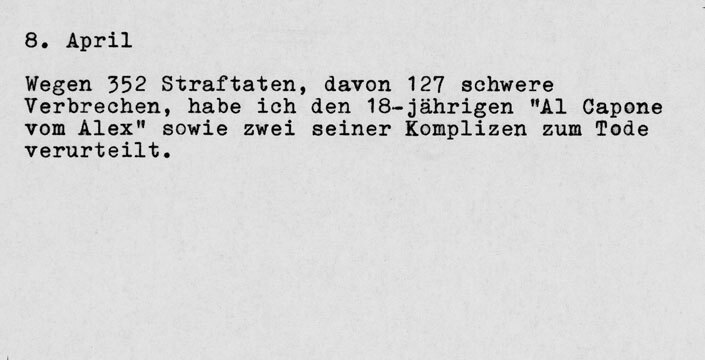 I take part in the biggest protest demonstration in GDR history. 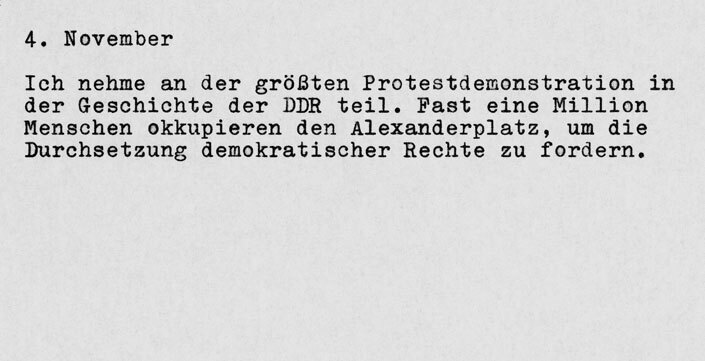 Almost 1 million people come to Alexanderplatz to push for democratic reforms. 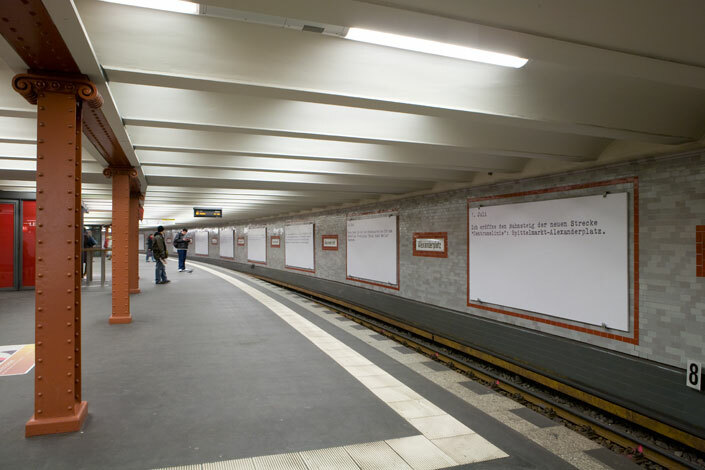 I stand on platform D of the Alexanderplatz subway station and see 26 posters on the walls depicting the theme, Peace on Earth . 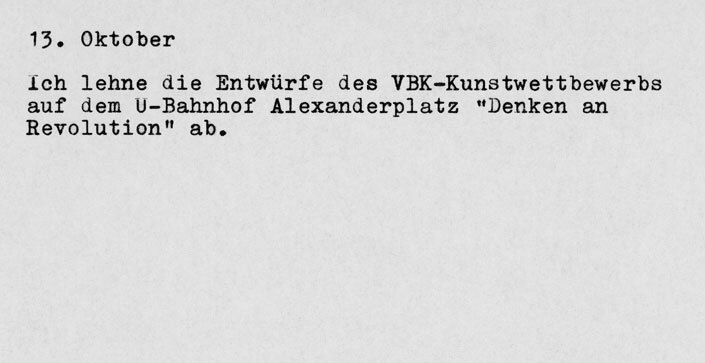 This is the first exhibition at a Berlin station by the artists association (VBK), headed by Klaus Wittkugel. 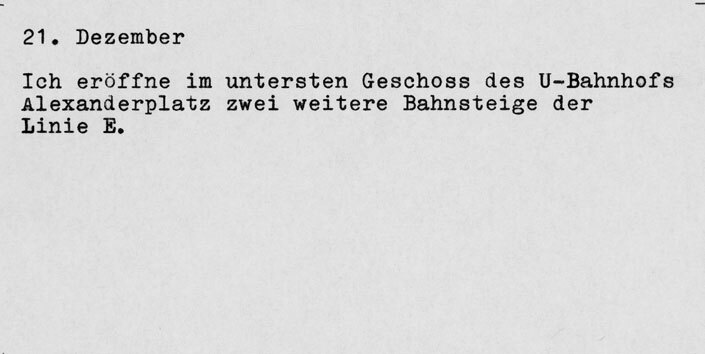 Today I laid the foundation stone for the Haus des Lehrers and the Kongresshalle. 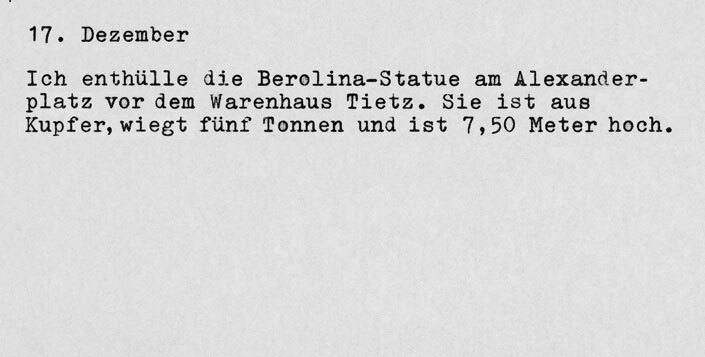 I unveil the Berolina-statue in front of the Tietz department store at Alexanderplatz. It is made of copper, weighs five tons and is 7.5 meters tall. 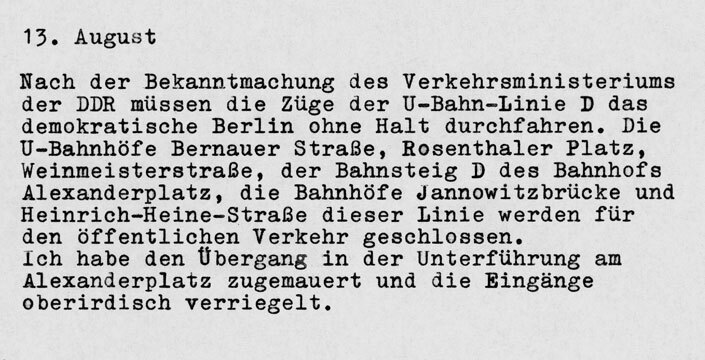 Thanks to my new traffic plans, for the first time in three decades you can finally ride across Alexanderplatz with the tram again. 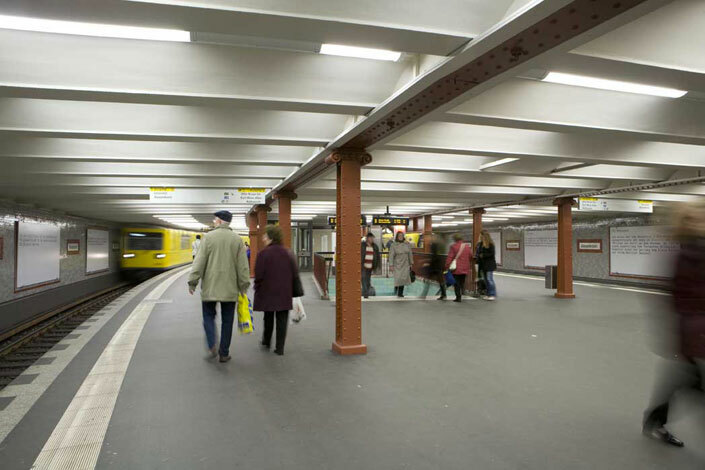 I open two more train platforms for the line E , on the lowest level of the Alexanderplatz station. 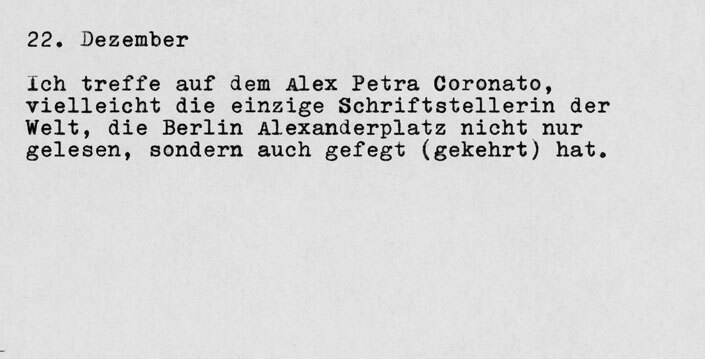 At Alex I meet Petra Coronato, perhaps the only author in the world who has not only read "Berlin Alexanderplatz" but also swept it. 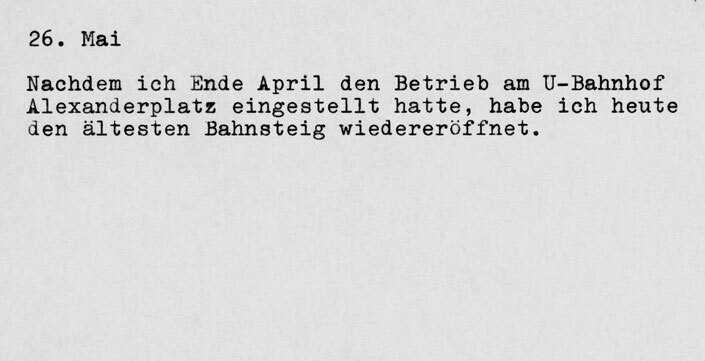 > > > CLICK HERE TO SEE THE BOOKLET . . .